Restore your work surface and give your kitchen or bathroom a whole new look with this simple paint project. Let’s face it: Laminate isn’t the most high-end countertop material out there, and when it starts showing signs of wear it can really make your kitchen look shabby. 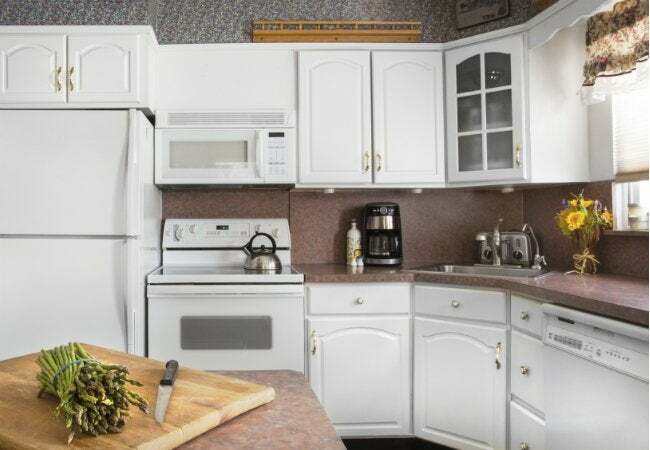 But if new countertops aren’t in your budget right now, show your current ones some love with a paint job to extend their life for a few more years. There are several kits on the market—including those that replicate stone or granite—or you can simply use acrylic interior paint in the color(s) of your choice. The two keys to professional, lasting results are careful preparation and proper sealing. Here’s a plan for your counter attack! Whether you’re redoing the cabinets in the bathroom or the kitchen, start the job by prepping your space correctly. Protect all cabinets and floors with drop cloths or plastic sheeting held with painter’s tape. Then open all windows and operate fans to ensure you’ve got adequate ventilation. Some of these materials are extremely stinky! Scrub the surfaces you’ll be painting thoroughly with a degreasing cleaner to ensure all dirt and grease is removed. Let dry. Put on protective gear (goggles, gloves, and a dust mask or respirator) and go over the entire surface lightly with 150-grit sandpaper to help paint adhere. Thoroughly wipe your counters clean of dust and debris with a slightly damp rag. Let dry. Prime patiently. Apply a thin, even coat of primer with a paint roller, following manufacturer’s directions. Allow adequate drying time and then apply a second coat. Let dry. Now, break out the paint. If using a paint kit that emulates stone or granite, follow the directions for blending the paints and apply, allowing adequate drying time between layers. If simply using acrylic paint, roll on a first coat, let dry and then give it a second coat. Seal to finish. 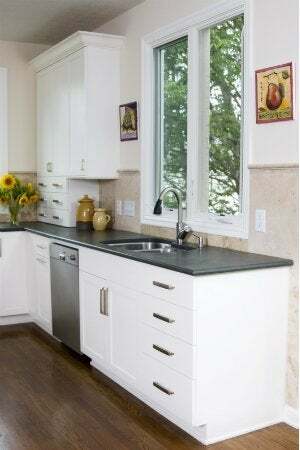 Countertop resin will ensure lasting results. Stir and mix the product according to manufacturer’s directions. Carefully pour the resin over the painted surface and use a fresh foam roller to distribute it evenly. Watch for drips along the edges and wipe off any that occur immediately with a damp rag. Also keep an eye out for any bubbles that may appear as the resin levels out: Pop them as soon as they appear by aiming a blowtorch at them, holding it a few inches away. If you have no torch, try banishing bubbles by blowing at them through a drinking straw. Allow the resin to thoroughly cure according to manufacturer’s specs. To maintain your “new” countertops, skip abrasive cleaners and scrubber sponges and clean daily instead with a rag or soft sponge and mild dish detergent. Once a week (or at least monthly), wipe down with a small amount of mineral oil and a clean, soft cloth. Your surfaces will look super for several years to come—you can count on it!